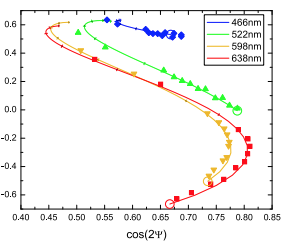 We present the use of a commercially available fixed-angle multiwavelength ellipsometer for quickly measuring the thickness of NbN thin films for the fabrication and performance improvement of superconducting nanowire single photon detectors. The process can determine the optical constants of absorbing thin films, removing the need for inaccurate approximations. The tool can be used to observe oxidation growth and allows thickness measurements to be integrated into the characterization of various fabrication processes.